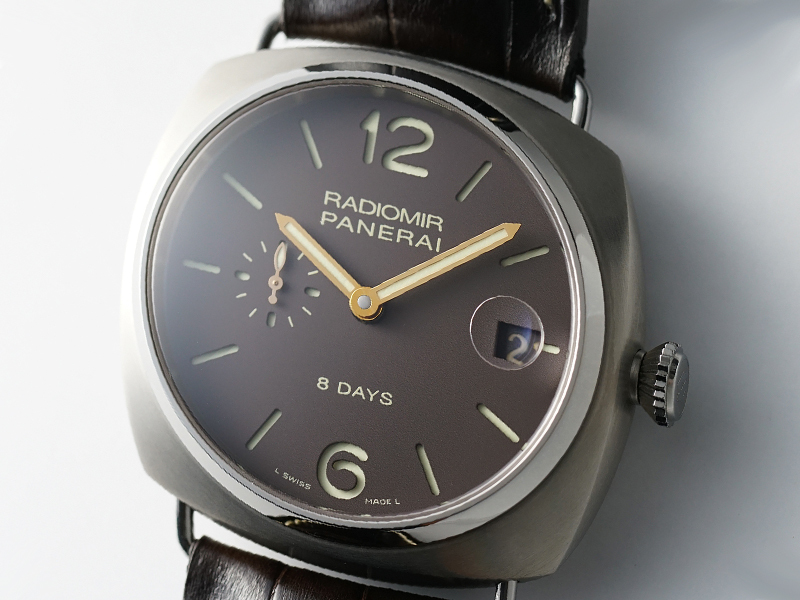 Let’s zoom in on a mixture of metals in the form of this “Officine Panerai Radiomir 8 Days Titanio”, which was originally released in 2010 at the SIHH. 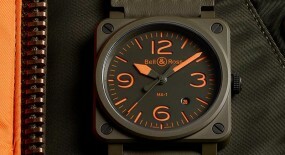 This watch is currently in stock at EiT and we’ve reviewed it below. 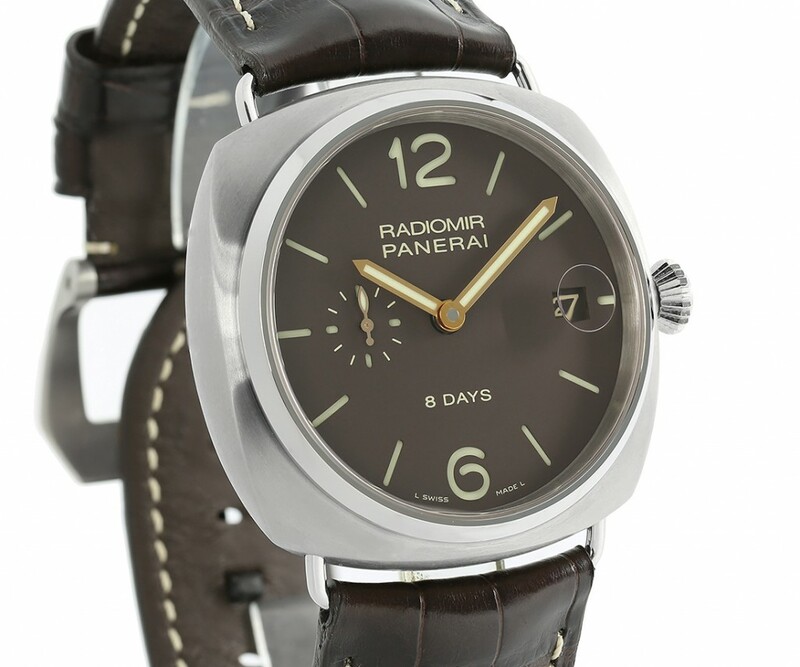 To start we notice this watch has the aesthetic of a large wire lugged Radiomir, but with a wearability that has to be seen to believe. 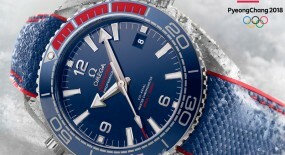 Despite its 45mm case it manages to be well planted with a perfect stance on the wrist. 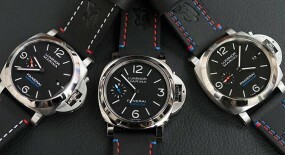 Now, the style of this watch is still big and it will look over-sized on the wrist, but that’s always been part of the Panerai style. 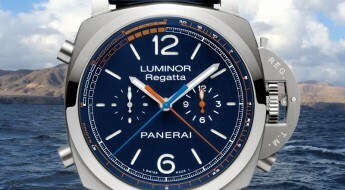 For that matter Officine Panerai is not the first brand that comes to mind if your aim is to buy a nice dress watch. 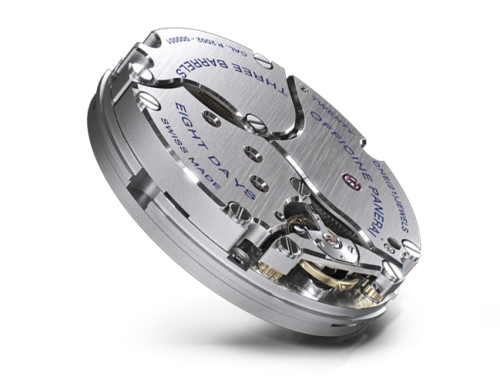 The 45mm cushion case is made of titanium with a 16mm thickness to it and a transparent case back, which allows to view the inner workings of the mechanical movement. 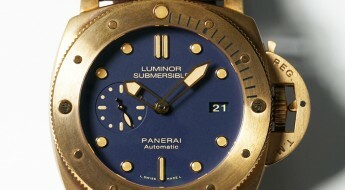 Overall the case exhibits an inventive combination of a subdued satin-finish across its complex compound curves, as glancing over its side angles reveals. 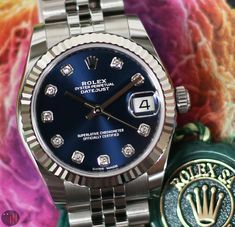 Mounted to the case is a high-polished bezel with a conical form, which meshes well with the domed arch of the scratch resistant sapphire crystal, set on it to cover the dial. A small detail, but worth highlighting for assisting with the unencumbered passage of a cuff, unless its just too tight for those elevated 16mm. 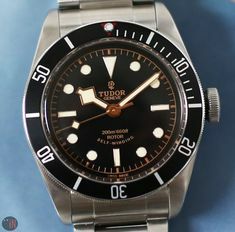 Also equipped with a screw-down crown, which assists with water-resistance on this timepiece reaching up to 100 meters (330 feet). 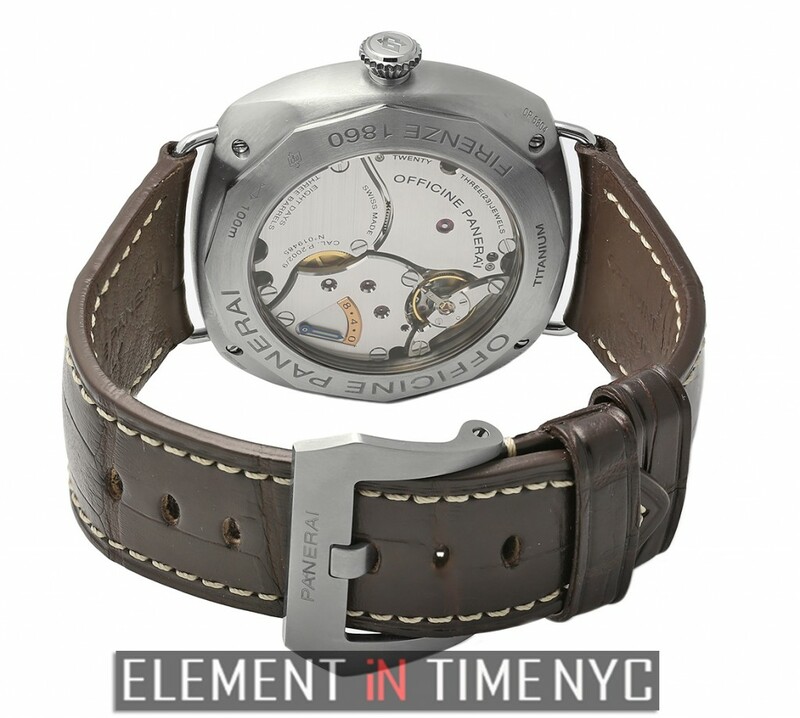 The choice of titanium suits this piece very well, as it redistributes its mass evenly thru out the case, without bringing any pressure points or hot spots to the wrist, due to the flat caseback. So, once again its size can be very misleading, since it doesn’t weigh as much as it seems, nor does it cause any sense of inertia or pendulum. 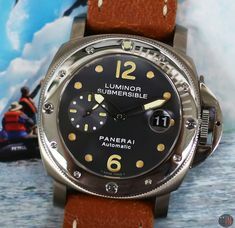 Definitely a wise decision to have equipped this watch with the standard Panerai wire lugs, instead of opting for straight welded lugs, like those seen on the 1940’s models. Time is exhibited on a brown tobacco colored sandwich dial, with hour index markers and the Arabic numerals for the 6 and 12 o’clock positions. 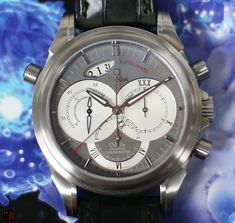 There is a sub-seconds dial at the 9 o’clock position and a date aperture with a magnified window at the 3 o’clock position. 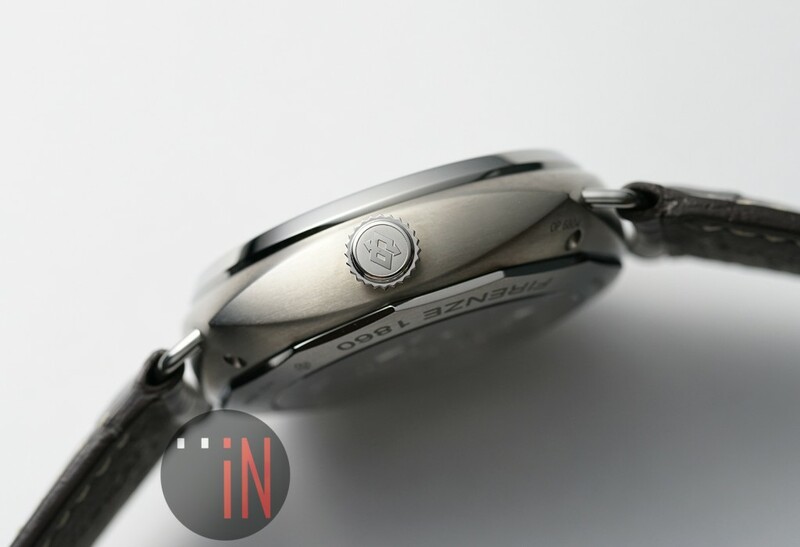 This watch also has included a power reserve indicator, but you’ll have to flip it over to view, since its been placed on the transparent case back. 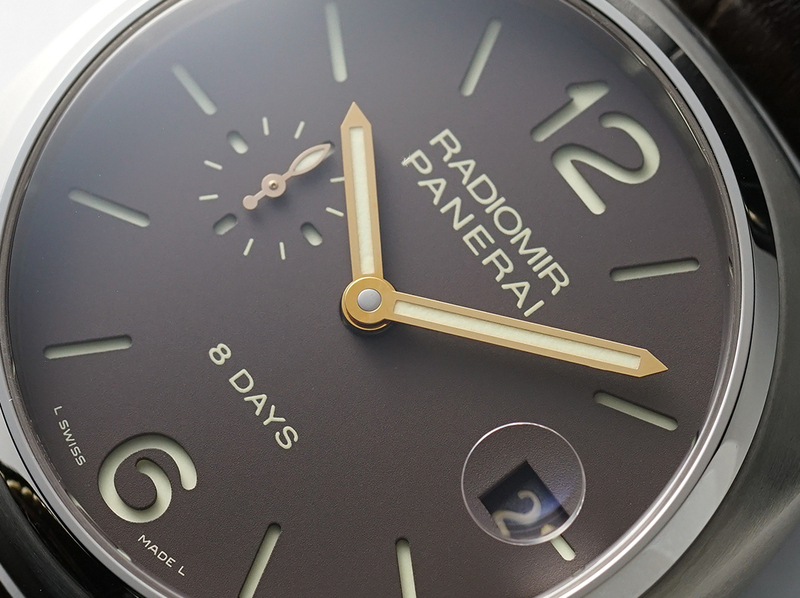 A dial with extreme legibility made with the traditional depth of the stencil found placed over the fully lumed disc, forming the iconic Panerai sandwich dial. 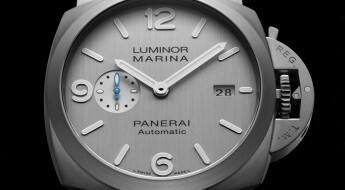 A construction that can be traced back to the origins of watchmaking for the Italian Officine Panerai brand, all the way to the 1930’s. This construction creates a wonderful three-dimensional look, in low or adequate light conditions. All the hands, hour index markers, the sub-dial and the Arabic numerals have been fitted with a luminescent coating to shine a green lume in the dark. The warmth of the 18k rose gold central hands plays very well with the tobacco brown of this dial. 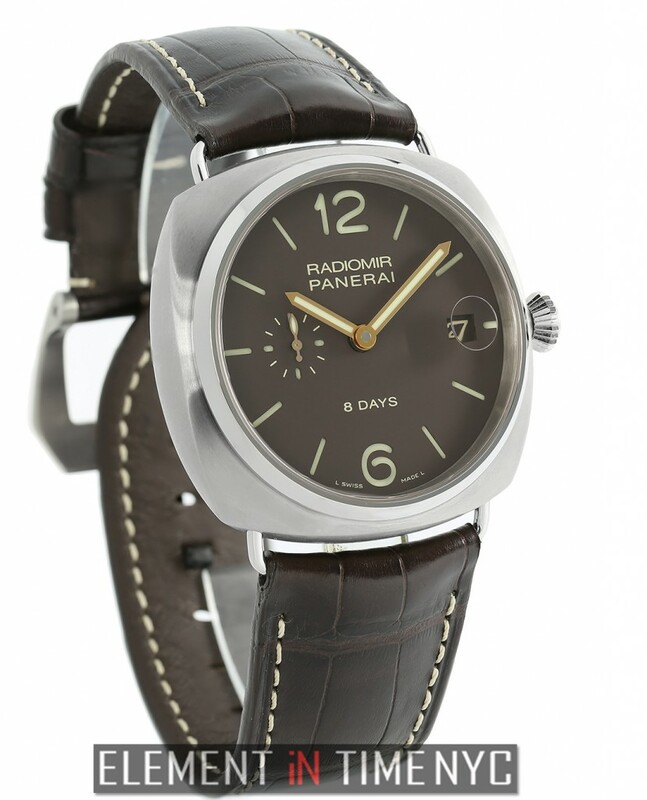 Plus the exclusion of the radium patina which has become a trend in the Officine Panerai catalogue, especially in a watch with this combination of elements was a wise choice. 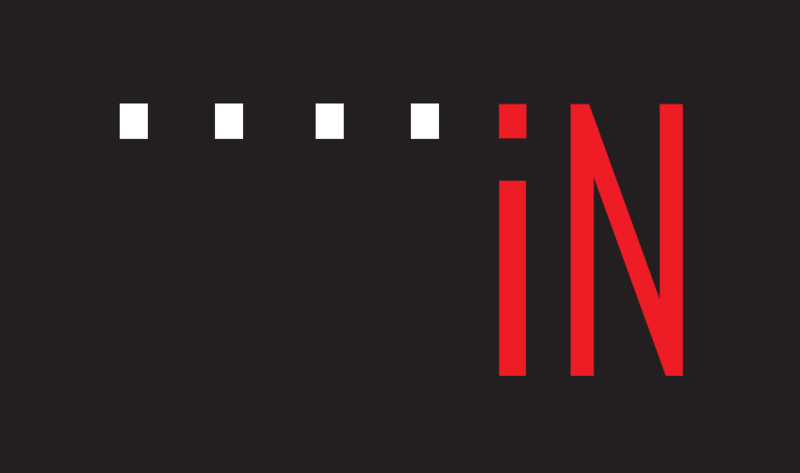 It is an aesthetic decision not all seem to have come to an agreement over; some prefer it, some don’t; but, either we feel its absence here isn’t missed. 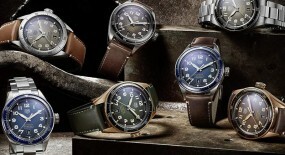 Some view the “patina trend” as a fad comparable to wearing pre-faded or pre-torn jeans, but thankfully this watch isn’t trying to be something it isn’t. So, here we have a gorgeous pair of rose gold hands over a tobacco brown combination, without the faux patina. 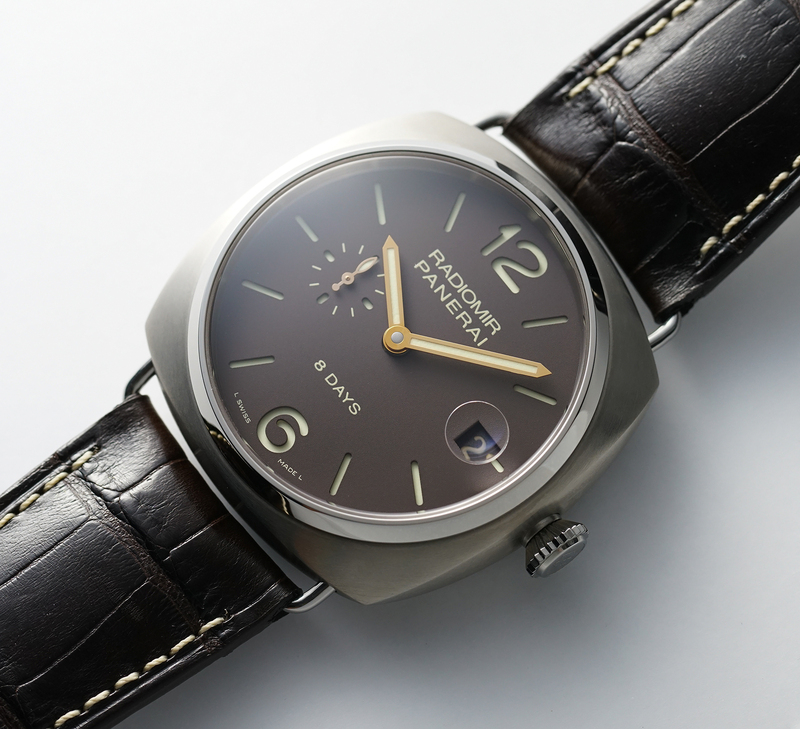 Instead Panerai has added more useful features such as the aforementioned magnified date aperture, similar to the cyclops lens found on many Rolex’s, except Panerai places it underneath the crystal, instead of on top like Rolex does it. 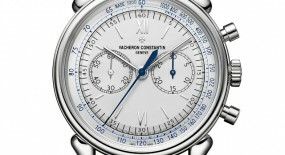 Which in my opinion provides a much more elegant finish to the overall look of the watch. 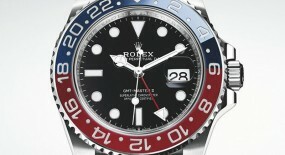 And it’s been placed over a monotone date-disc that nicely matches the base color of the dial. 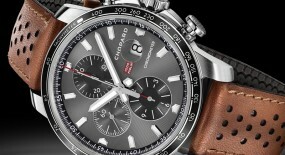 Another well thought out feature on this timepiece was the inclusion of a “time-zone” function. So, when you screw out the crown and find its first position, you can easily move the hour hand independently of the minutes and seconds hands. 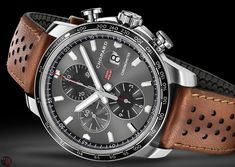 This allows to re-set the date in a quicker manner and if you’re a frequent traveler it allows to change the time without stopping the seconds or affecting the isochronism of the watch. 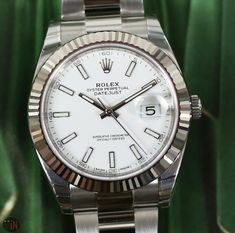 Or, if you do want to affect the synchronization of the watch, just pull the crown all the way out to its extremity and you’ll see the sub-seconds hand jump to its zero re-set point (pointing upward to 12 o’clock). 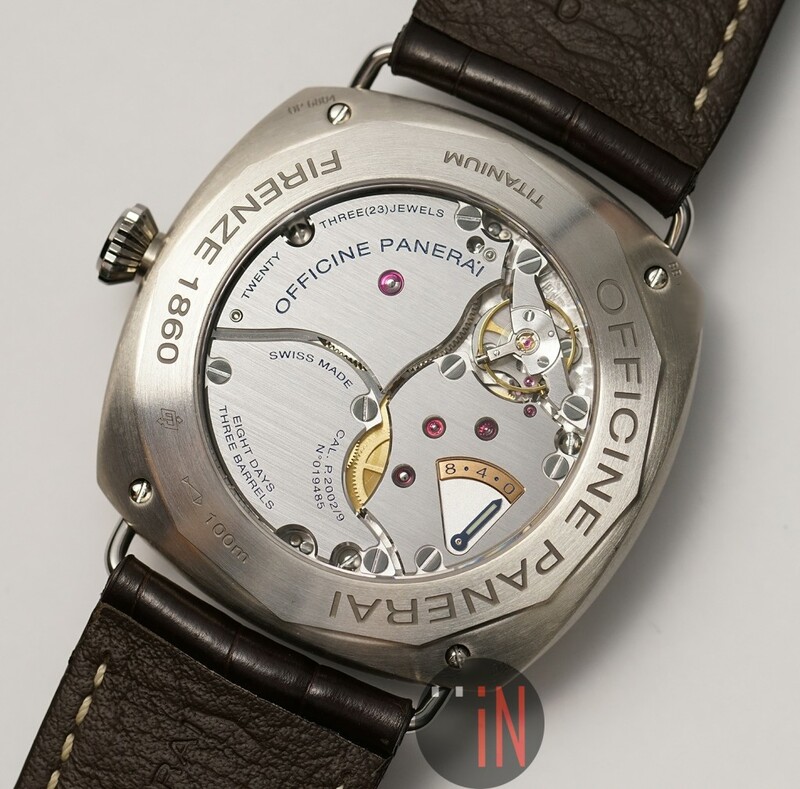 Part of the original family of in-house developed Panerai mechanical movements, like the caliber P.2002/9 in this watch, can be made to synchronize the seconds by resetting it. Afterwards if you want to set this watch to an atomic clock, just move the minutes hand to the next nearest 5-minute hour index marker and wait for your reference time to catch up and when it does: hours, minutes and seconds all perfectly match up; push the crown back in. Now the beat of the balance resumes and you’ve successfully synchronized the watch. 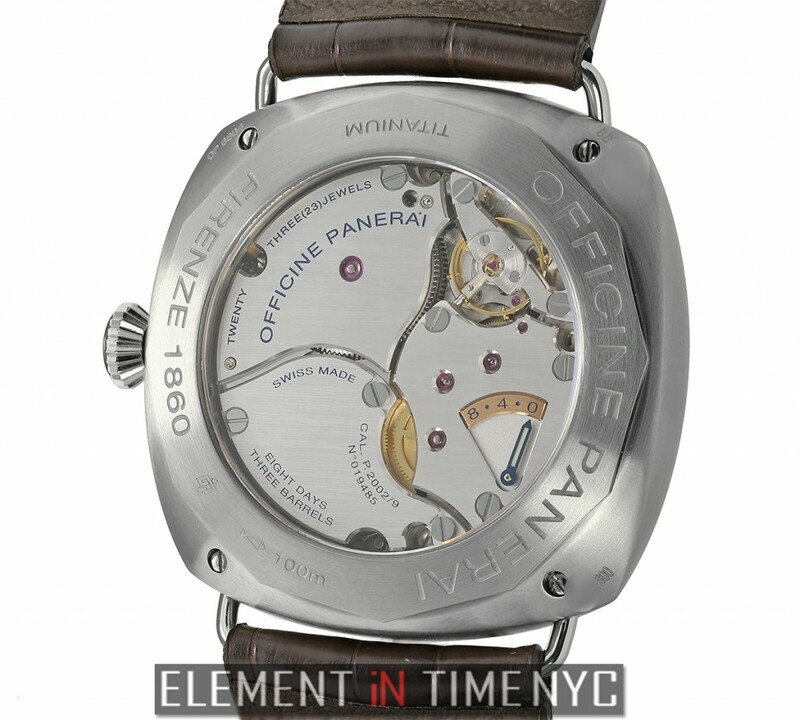 The “Officine Panerai 45mm Radiomir 8 days Titanio” Tobacco Dial (Ref#: PAM 346) is powered by a hand-wound mechanical movement, caliber P.2002/9 with 21 jewels, 269 components and 28,800 Vph. 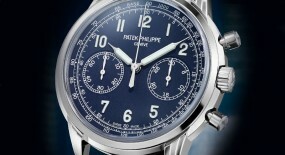 Power reserve on this timepiece can last up to 192 hours (8 days). 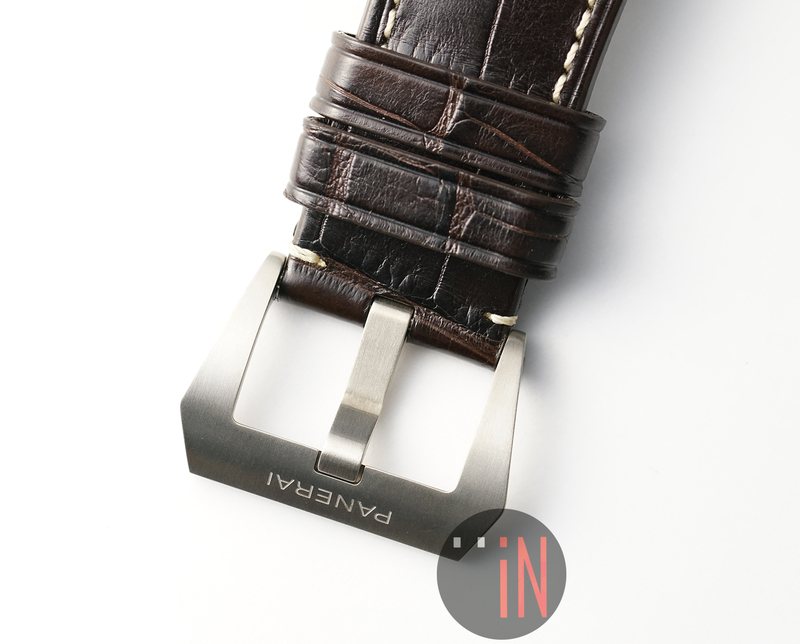 Mounted to the watch is an Officine Panerai brown alligator strap with exposed ecru stitching for an aged look, while secured to the wrist by an Officine Panerai large-size brushed satin-finished titanium tang buckle. 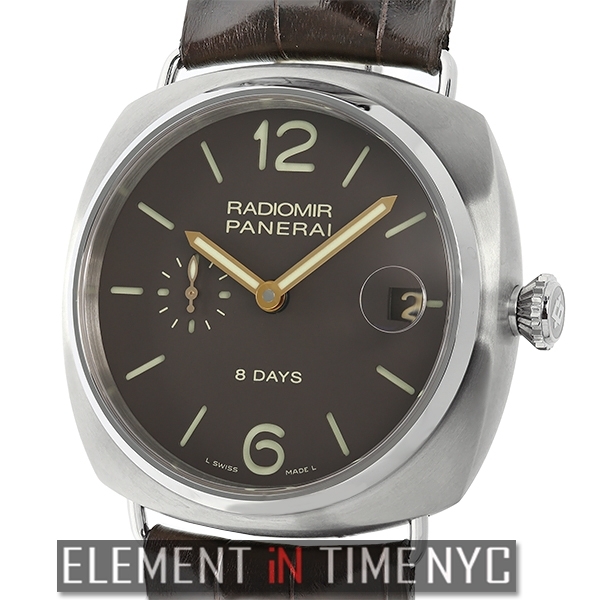 This watch is currently in stock, visit the official Element iN Time website here for more details.